Arras is famous for its two grand arcaded Flemish-style squares: Grand’Place and Place des Héros which, with Rue de la Taillerie form a monumental architectural ensemble unique in Europe. The squares have an historic and harmonious character surrounded by restored 17th and 18th century baroque houses with their curved rooflines. 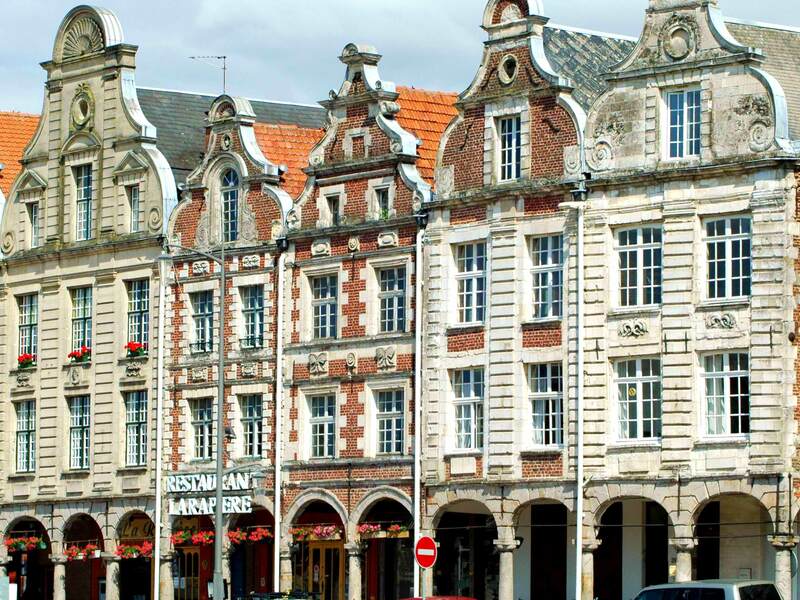 The two squares were initially built to host markets which reflected the prosperous trading economy of Arras. In the 17th century, the municipal magistrates decided to redesign the two squares and the Rue de la Taillerie by constructing more harmonious buildings around them. To achieve this, they constructed a building using a 15th century Gothic house as a model. Number 47 Grand’Place can still be seen today. Overall, 155 houses were built in the Baroque style with typical Flemish gables individually decorated with garlands of flowers, ribbons or horns of plenty. The façades of the houses are made of brick and white stone rendered with a coloured finish. At street level, arcades are supported by sandstone pilasters. The arcades were necessary in order to comply with regulations dating from the 16th century forbidding any projection over the streets. In addition, the arcades were designed to prevent the spread of fires. On a more practical level, the arcades were used to shelter the merchants’ customers while they negotiated the sale of their goods. 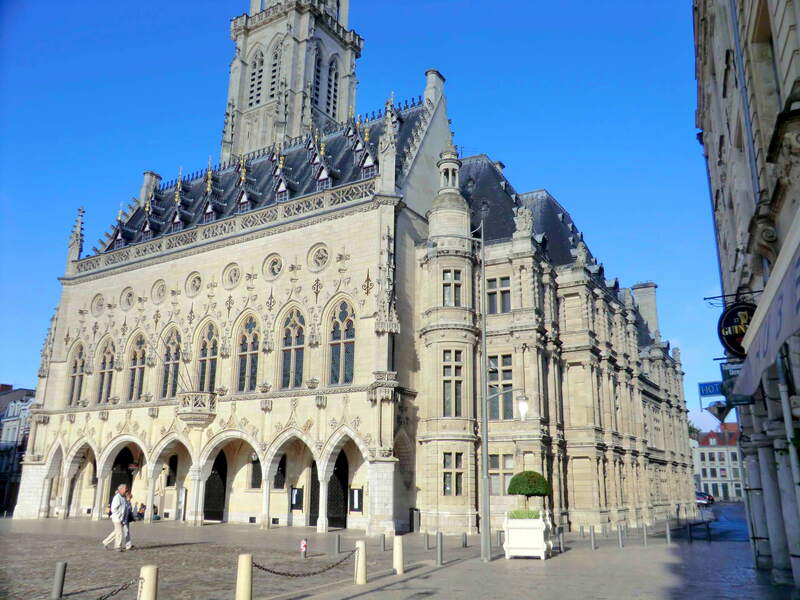 Town-Hall , Arras © Mélanie Huguet, licence [CC SA 3.0], from Wikimedia Commons. The smallest square, Place des Héros (also called Petite Place), is overlooked by the majestic Town Hall originally built in 1502. This Gothic structure is flanked by a superb 77 metre-high belfry built between 1463 and 1554. 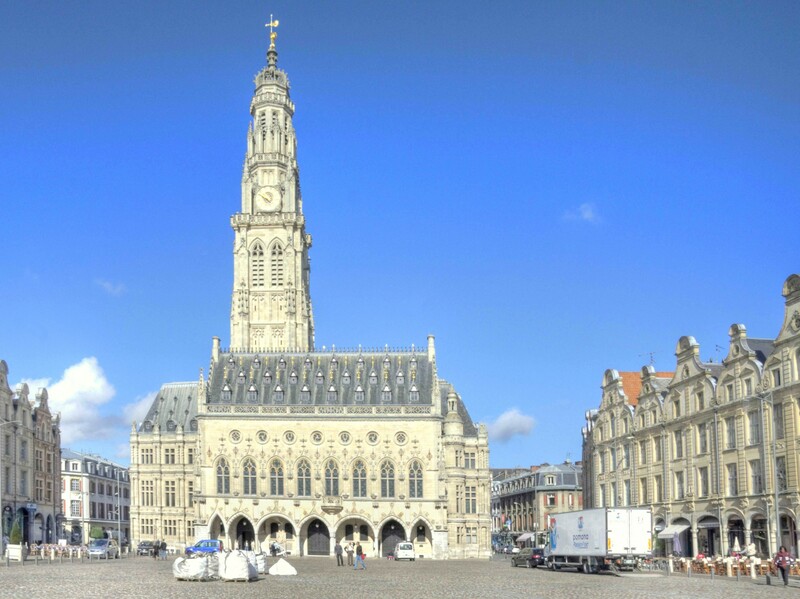 Place des Héros, Town-Hall and Belfry, Arras © Pir6mon, licence [CC SA 1.0], from Wikimedia Commons. At the top of the bell tower, the golden statue of the lion of Arras is brandishing a cross. The lion stands on top of a crown of stone dating from the reign of Charles V of Habsburg and inspired by the belfry of Audenarde (Belgium). At the time of construction of the belfry, Arras was part of the Holy Empire and was ruled by the Habsburgs of Spain who allowed Arras to enjoy a certain autonomy. When French King Louis XIV seized Flanders and Arras from Spain, the city’s people added a sun on one of the branches of the cross to demonstrate their goodwill towards their new king. Indeed, they did not want to remove the crown which also reflected the autonomy enjoyed by the town before the French annexure. 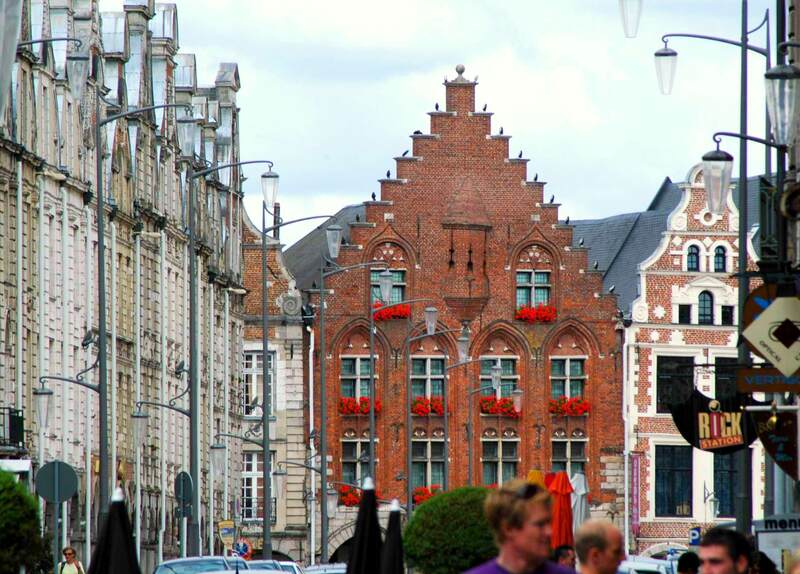 The belfry houses a chime of 40 bells and it is possible to access the top of the bell tower where one can enjoy fantastic views over the squares and the town of Arras. Access to the first level is by a 40 metre-high lift. The belfry was listed as a UNESCO World Heritage Site as part of the Belfries of France and Belgium in 2005. 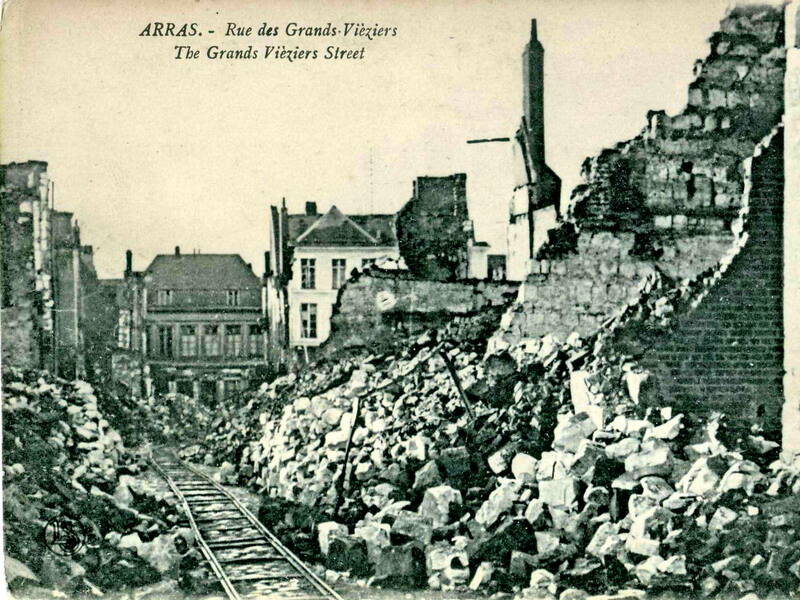 During the First World War, Arras was heavily bombed, particularly in September 1914 and May and June 1915 when all the buildings around the two squares were destroyed, including the belfry and the town hall. Only 5% of the houses in the town remained untouched, the others being damaged or completely destroyed. Thanks to a 1919 law providing that all ancient monuments should be rebuilt to their initial state before the war, Arras’ squares and buildings were reconstructed. The reconstruction, however, took a long time: from 1919 to 1934, as many buildings required had to be completely rebuilt rather than simply restored. Two-thirds of the 155 façades of the Grand’Place and Place des Héros had been obliterated. Today, one can appreciate the beautifully restored squares of Arras as if nothing had happened, while enjoying a coffee on one of its terraces.